Open Firefox menu. Depending on Firefox version, you can click on the three stacked lines icon on the top right corner, or click on Firefox drop-down menu on the top left corner, or hit Alt key to reveal the menu bar. Open the Help menu (newer version it’s question mark icon as shown in figure below). You can type about:support in the address bar to go to “Troubleshooting Information” page directly. 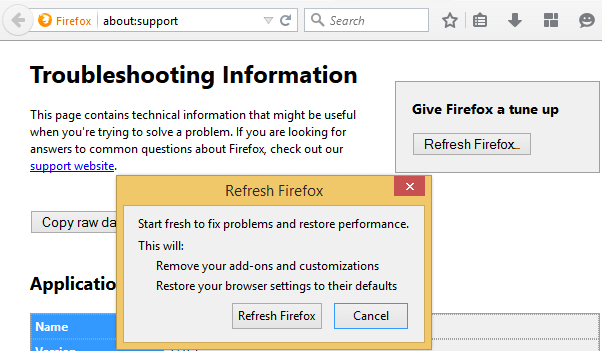 Click on Reset Firefox or Refresh Firefox, twice, on the Troubleshooting Information page and the confirmation dialog. Firefox will close and restart to perform the reset or refresh.. When it’s done, a window will list the information that was imported. Click Finish and Firefox will open. Reset and Refresh essentially do the same things. Depending on the version of Firefox you use, you will only see one of them. 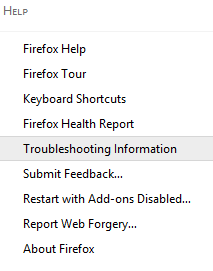 Resetting or refreshing Firefox feature works by creating a new profile folder and copying only the important data from old profile. Profile folder stores all your Firefox settings and personal information. Reset and refresh erases extensions and themes, website permissions, modified browser preferences, added search engines, site-specific preferences, download history, DOM storage, security settings, download actions, plugin settings, toolbar customizations, user styles and social features. Firefox will save your bookmarks, browsing history, passwords, form history, cookies, web form auto-fill information, personal dictionary, open windows, tabs and tab groups. In addition, the old profile will be placed on the desktop in a folder titled “Old Firefox Data”, where you can attempt to recover any lost important data.